“Buta” means pork and “Aburiyaki” means grilling lightly in Japanese. 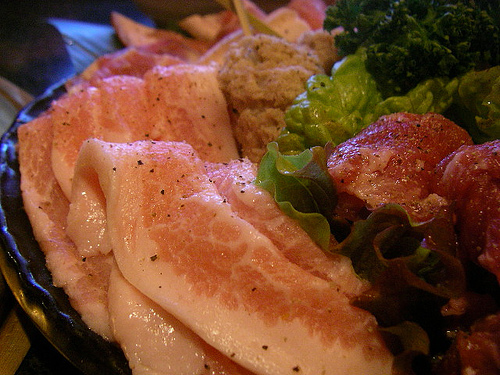 The varied part of pork is used for “Buta Aburiyaki”. Pork shoulder, loin, side, and guts of it, too. For example, “Tecchan” is the guts grilled and flavored a sauce with spicy miso (soybean paste). It’s popular because the unique saltyness of miso is very good with beers. In addition to the guts, the other part of pork always grille with sauce flavored somehow. A ginger fried pork is the most popular dish in grilled pork, a “Negi-shio (Negi means green onion, shio means salt)” sauce is used for the purpose of turning fatty taste to light one, and you know a pork with garlic sauce is the best combination for increasing our appetite. A pork is unpopular in comparison with beef and chicken, but it is used many kinds of dishes, Tonkatsu (deep-fried pork cutlet), Nikomi (pork giblet stew), Tonkotsu-Ramen (Tonkotsu means bones of porks), Kakuni (pork belly) and so on. Especially, the part called “Tontoro” is very popular in Japan. That is fatty meat of the area from the cheek to the neck. The fat is more light than the normal one and it is usually eaten with rock salt. The secret of popularity is that healthy image for its looking. Do we want a repeat of the Shrek incident? I winced at the reminder.